New potatoes straight from the garden can be enjoyed by diabetics. New potatoes straight from the garden can be enjoyed by many diabetics. This page was updated on 16th March, 2019. Having said that, all diabetics are different; some can enjoy brown rice, others can't; russet potatoes are to be avoided by all, along with refined starches, as they cause an immediate spike in blood glucose; the trick is to do a test about sixty minutes after a meal of new potatoes; if it hasn't returned close to the pre-dinner levels then you too should avoid them. Your spuds are controversial if you are insulin resistant; the problem is a vast difference in the glycemic index and load between different varieties. Boiled russets and particularly french fries are simply a disaster for diabetics, and actually not good for any of us. Those that have no desire to be injecting themselves in the future should avoid them. That extra sugar that is being let loose in the blood attaches to the red blood cells, forming what is known as an AGE; it's very damaging to blood vessels, nerves and the retina of the eye. The joy of new potatoes is that they can be enjoyed in moderation by many diabetics; and, for all those who love a spud, those straight from the garden are so tasty. What exactly can be called a new potato? Marketers cheat and in the UK some spuds that had been in storage for over six month were being marketed, so it's a case of buyer beware. A new potato has a thin skin that can be easily scraped off with your nail; it does not keep so it should be eaten within three days before it's turned to starch. So you'll only get them in small packets and thus they cost more; unless you grow them yourself. Lift only enough for today and perhaps tomorrow. 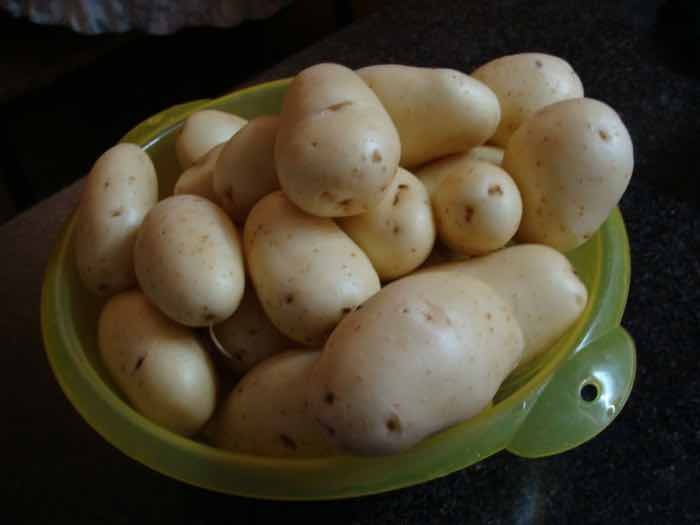 New potatoes along with the reds are known as waxy, as they have half the glycemic load. There's another good reason to enjoy new potatoes; they aren't sprayed with a herbicide like Glyphosate, marketed as Roundup, just days before harvesting to desiccate the plant. Scientists have changed the grading from 'possibly' to 'probably' cancer causing; residues are in many of the foods we eat. Monsanto, the company that manufactures glyphosate is not happy. The European Court of Justice has in March, 2019, forced them to release the studies that supposedly claim that Roundup is safe, and has no effect on human health; up to now they have fervidly refused to allow to peruse their research methods. Now independent scientists have the opportunity to see if it's bogus science based on falsification of the statistics; in short, fake news. Do you ever wonder why almost every family is touched by the big C or an autoimmune disease? I scrupulously avoid all the chemicals in food; I treat them the whole lot with suspicion. That puts me on the edge of orthorhexia but having witnessed personally so much metastatic sickness amongst patients and family, I have no desire to go out that way; I'd rather be labelled obsessive and a health nut. Remember, new potatoes have just over half of the starch of those that has been stored for months. In many diabetics they are reported to cause no glucose spike at all; test yourself. Even better, if you allow them to cool overnight in the fridge and then reheat them, retrodegradation links molecules of the amylose together so that it passes through the small intestine and instead of being absorbed as the starch passes into the colon to the microbiota there; that means less chance of getting an autoimmune disease like Parkinson's too. If you have a problem with moles in your garden, as we do, then don't plant your seed potatoes in rows; we have learned the hard way to plant them randomly; otherwise, having discovered the first, the little devils will devour the lot. Actually they do a lot of good in the garden, aerating the soil, but they can do a lot of damage to your new potatoes too; planting the moles' favourites in the mesh bags that many foods like onions come in certainly does help to keep them at bay. How to plant potatoes will help you get started; you'll notice that we used to plant them in rows; no longer. New spuds, do extra so they will retrodegradate by the next meal. Herbs like thyme and garlic. This is how to make them deliciously crispy on the outside with soft centres full or rich flavours. Cut your spuds in half and place them cut side down in a large shallow skillet with a lid. Add a cup of water, a good dollop of butter, half a teaspoon of salt and a few sprigs of thyme, and couple cloves of garlic. Boil for about fifteen minutes, remove the lid and boil further until the water has boiled off. Once they start to sizzle in the butter, remove the thyme and garlic, keeping the latter. Braise for another fifteen minutes until they are nice and crisp. Crush the garlic, add the juice of a freshly squeezed lemon, a tablespoon of chopped parsley perhaps, and a tablespoon of olive oil. Pour over the new potatoes and continue on moderate heat for another minute or two. Cool a half, refrigerate until tomorrow by which time the starch will have retrograded, reheat and you can enjoy them without guilt. Remember that refrigerating any carbohydrate overnight causes the starch to retrograde; molecules link together making it more difficult for the enzymes in the small intestine to digest them. The net result is less of a blood glucose surge, only a minor need for insulin and so it's also less fattening as it's not immediately stored as first glycogen and any excess as adipose. Instead the healthy bacteria in the colon feed on them greedily to produce many healthy byproducts, but little glucose, and more gas unfortunately. Read more about this at reheating resistant starch. Let's state it candidly if you want to live long in the land; avoid all processed carbohydrate, and in general keep your total starch to less than 150g per day. Diabetics should be less than 50g per day, and even lower if they are unstable. Research from Tufts University shows the average American is consuming half a cup of sugar per day, much of it hidden in sauces, soups and cereals; that alone is 85g.